Background: The optimal duration of antibiotic therapy in older patients with uncomplicated urinary tract infection (UTI) is still a matter of debate. The aim of this randomized controlled double-blind noninferiority trial was to compare the efficacy and safety of 3-day and 7-day courses of oral ciprofloxacin for uncomplicated symptomatic UTI in older women. Methods: A total of 183 women at least 65 years of age with acute uncomplicated UTI were recruited from ambulatory clinics and hospital acute care units. Patients with pyelonephritis, contraindications to fluoroquinolones, recent use of antibiotics, urinary tract abnormalities and diabetes mellitus were excluded. Women were randomly assigned to receive either ciprofloxacin 250 mg twice daily orally for 3 days followed by placebo for 4 days (the 3-day group, 93 patients) or ciprofloxacin 250 mg twice daily orally for 7 days (the 7-day group, 90 patients). Bacterial eradication, clinical improvement and occurrence of adverse events were determined 2 days after completion of treatment, and occurrence of reinfection or relapse were determined 6 weeks after completion of treatment. Bacterial eradication and relapse were determined by urine culture. Double-blind procedures were maintained throughout data collection. Results: The proportion of patients with bacterial eradication at 2 days after treatment was 98% (91/93) in the 3-day group and 93% (83/89) in the 7-day group (p = 0.16). The frequency of adverse events, including drowsiness, headache, nausea or vomiting, and loss of appetite, was significantly lower in the 3-day group. Interpretation: These results suggest that a 3-day course of antibiotic therapy is not inferior to a 7-day course for treatment of uncomplicated symptomatic UTI in older women, and that the shorter course is better tolerated. Urinary tract infection (UTI), one of the most frequent infectious diseases in older women, is associated with significant morbidity.1 Factors contributing to the higher incidence of UTI with age include urinary tract anomalies, changes in hormonal status, decline in the immune system, and high rates of incontinence, malnutrition, functional disability and coexisting illnesses.2 The optimal duration of antibiotic therapy in older women is still a matter of debate.3,4,5 A short course of therapy (e.g., 3 days) appears generally effective in young women,6,7 but this approach has not been validated in older women, possibly because of concerns about the vulnerability of this population. In many geriatric settings, the typical duration of treatment ranges from 5 to 10 days. A shorter course of treatment might offer significant advantages in terms of improved compliance and fewer drug interactions and side effects, but efficacy must be clearly demonstrated before this approach is implemented. The objective of this randomized controlled double-blind noninferiority trial was to compare 3-day and 7-day courses of oral antibiotic therapy (ciprofloxacin) for the management of uncomplicated symptomatic UTI in older women. The study protocol was approved by a research ethics committee in each participating hospital, and all participants provided written informed consent. Women 65 years of age or older with uncomplicated symptomatic UTI (also known as cystitis or lower UTI) were eligible for the study. The diagnosis of symptomatic UTI was based on the following criteria: significant bacteriuria, determined by urine culture and defined as at least 105 colony-forming units of an identified single uropathogen per millilitre of urine, accompanied by at least 1 of 6 possible symptoms (dysuria, frequency, urgency, suprapubic pain, burning on micturition, or onset or aggravation of urinary incontinence). Urine specimens were obtained by midstream collection or catheterization. Exclusion criteria included signs of pyelonephritis or septic shock, use of antibiotics in the preceding 3 days, calculated creatinine clearance less than 30 mL min–1 1.73 m–2,8 known hypersensitivity to fluoroquinolones, structural or functional abnormalities of the urinary tract, significant urinary retention (residual volume greater than 100 mL), use of an indwelling catheter in the preceding 6 days, immunodeficient state and diabetes mellitus. Potential subjects were identified through daily monitoring of the patient logs of microbiology laboratories at all acute care hospitals in the Quebec City area. These public facilities culture urine samples for all inpatients and most ambulatory patients from medical clinics in the surrounding area. Women in whom UTI was suspected on the basis of urinalysis were first contacted by the treating physician, usually the same day, to verify their interest in participating in the study. Subjects who had already started antibiotic therapy were excluded, unless the antibiotic was ciprofloxacin 250 mg twice daily, started within the preceding 48 hours, since all subjects in the trial received this treatment during the first 3 days. A research nurse then met, in the hospital or in their respective homes, all interested subjects with culture-confirmed UTI to determine eligibility and to assess the presence of symptoms; consenting patients who met the eligibility criteria were then randomly assigned to treatment groups, and therapy was initiated. Both inpatients in acute care hospitals and outpatients living in the community were included in the study, but potential subjects living in nursing homes and long-term care institutions were excluded. Participants were randomly assigned to 1 of 2 treatment groups: ciprofloxacin 250 mg given orally twice daily for 3 days followed by placebo twice daily for 4 days (the 3-day group) or ciprofloxacin 250 mg given orally twice daily for 7 days (the 7-day group). All tablets were of identical appearance, and double-blind procedures were maintained during the entire study period. Randomization was stratified by participating hospital laboratories to ensure equal allocation of subjects selected through the different laboratories. Computer-generated randomization lists were drawn up by the consulting statistician and given to the pharmacy department in each hospital. The research nurse responsible for evaluating eligibility allocated the next available number when a woman entered the trial and distributed to her the corresponding set of 14 consecutive tablets obtained from the pharmacy department. The subjects' codes were sealed in individual envelopes, which were kept by the study statistician and revealed to the researchers only after recruitment, data collection and laboratory analyses were complete. No envelope had to be opened for safety reasons during data collection. During the baseline visit, each subject was interviewed to obtain demographic characteristics and to assess the presence of UTI symptoms and any history of previous UTI. Functional status was assessed with the Système de mesure de l'autonomie fonctionnelle (SMAF). This instrument, developed and validated with a French-Canadian population,9 comprises 29 items covering activities of daily living and instrumental activities of daily living. It allows for the calculation of an overall functional score, with high scores indicating a low level of functional autonomy. During follow-up, urinalysis and urine culture were repeated for all participants on day 5 and day 9 after initiation of treatment. The urine specimens were obtained by midstream collection or catheterization (when necessary) and were collected at home by the research nurse or in hospital by nursing staff. Culture was performed at both time points in all subjects to allow subsequent evaluation of efficacy 2 days after completion of treatment without breaking the blinding procedures. Evaluations on day 5 and day 9 also allowed assessment of compliance with treatment, as well as assessment of urinary symptoms and potential adverse events, including drowsiness, headache, abdominal pain, nausea or vomiting, diarrhea and loss of appetite. To evaluate the long-term risk of relapse, subjects were visited 6 weeks after randomization. This visit included collection of urine for urinalysis and culture, as well as a short interview about presence of urinary symptoms and history of UTI and antibiotic use in the preceding weeks. The 2 primary outcomes were antimicrobial efficacy at 2 days after completion of treatment and risk of relapse and reinfection at 6 weeks after completion of treatment. Urinalysis and urine cultures from day 5 for participants in the 3-day group and day 9 for those in the 7-day group were used to compare bacterial eradication at 2 days after treatment. Persistence of the initial pathogen was considered to represent treatment failure. Bacterial eradication was defined as total disappearance of the initial pathogen, reinfection as presence of significant bacteriuria caused by a different pathogen and relapse as recurrence of significant bacteriuria with the initial uropathogen at 6 weeks after treatment. The assessment of risk of relapse at 6 weeks after treatment (by urinalysis and urine culture) was restricted to subjects who exhibited bacterial eradication at 2 days after completion of treatment. The secondary outcome was clinical improvement from baseline at 2 days after completion of treatment (day 5 for the 3-day group and day 9 for the 7-day group). None of the subjects received pyridium during the trial. Adverse events were compared on the basis of information from both questionnaires (on day 5 and day 9) for all subjects to ensure equal periods for reporting events in the 2 groups (and thus avoid a shorter period for reporting events for the 3-day group). All assessments of outcomes were conducted without knowledge of group assignment. All analyses were by intention to treat. Demographic, functional, clinical and bacteriological characteristics at baseline were compared with the 𝛘2 and Student's t tests. Differences in eradication rates between the 2 groups were estimated on the basis of 2-sided 95% confidence intervals (CIs) with application of Wilson's score method.10 The 3-day treatment was considered noninferior to the 7-day treatment if the upper limit of the 95% CI for the difference in rates of eradication between the 2 groups was less than 10%. The choice of this margin of noninferiority was based on the expert opinion of an infectious diseases specialist (M.G.) and a geriatrician (M.M.) and on what has been frequently used in clinical noninferiority studies in younger populations.7 Assuming expected eradication rates of 90% in both groups,11 with a sample size of 90 subjects per group, a maximum allowable treatment difference (7-day minus 3-day) of 10% and an α level of 0.05, noninferiority could be demonstrated in this study with a power of 72%. Symptoms, adverse events, and relapse or reinfection at 6 weeks were compared by means of 2-sided Fisher's exact and 𝛘2 tests. A total of 183 subjects were randomly assigned to 1 of the 2 study groups, 93 in the 3-day group and 90 in the 7-day group. Demographic and baseline characteristics were similar for the 2 groups (Table 1), except for the presence of suprapubic pain, which was more prevalent in the 7-day group (p = 0.03). The predominant bacteria was Escherichia coli, isolated in 130 (71.0%) of the participants; Klebsiella pneumoniae was observed in 29 (15.8%) of the initial urine samples. There was no incidence of bacterial resistance to ciprofloxacin. In the 3-day group, 2 patients withdrew from the study during the treatment period, one because of treatment failure and the other for unknown reasons. At the 6-week follow-up, 3 further patients had been lost from this group (Fig. 1). In the 7-day group, one patient was excluded from the analysis because of immunosuppression identified immediately after randomization. A further 8 patients had withdrawn by 2 days after treatment, 2 because of treatment failure, 4 secondary to adverse events attributed to the medication and 2 for unknown reasons. By the time of the 6-week follow-up, an additional 6 patients had been lost from the 7-day group (Fig. 1). Fig 1: Flow of subjects through treatment protocols and follow-up. R = randomization. For the intention-to-treat analysis, all patients in the 3-day group who were lost to follow-up because of comorbidity or death or for unknown reasons were considered to represent treatment failure. In the 7-day group, death and withdrawal secondary to adverse events were considered to represent treatment failure, but patients lost to follow-up for other reasons (comorbidity, refusal to participate and unknown reasons) were considered to represent treatment success. On the basis of this analysis, there was no significant difference in rates of bacterial eradication 2 days after completion of treatment between the 3-day and the 7-day groups (98% v. 93%, p = 0.16) (Table 2). The exact 95% CI for the difference in proportions with eradication (7-day group minus 3-day group) was –11.9% to 1.9%. The upper limit of this CI is well below the predetermined level of 10%, which suggests that the 3-day treatment is not inferior to the 7-day treatment. Similarly, there were no significant differences in the rates of reinfection or relapse at 6 weeks after completion of treatment. Improvement in symptoms at 2 days after completion of antibiotic therapy was excellent in both groups: 91 (98%) of subjects in the 3-day group and 82 (92%) in the 7-day group reported disappearance or improvement in at least 1 symptom (p = 0.15). Improvement in specific symptoms was similar between the 2 groups, except for urgency, for which clinical improvement was better in the 7-day group (p = 0.05) (Table 2). Adverse events were relatively frequent in both groups during the initial 9-day study period. The proportion of subjects reporting an adverse event usually associated with ciprofloxacin use was higher in the 7-day group than in the 3-day group, and the difference reached statistical significance for reports of drowsiness (at days 5 and 9), loss of appetite (at days 5 and 9), and nausea or vomiting (at day 9 only) (Table 3). The mean number of reported adverse events per subject was less for the 3-day group than for the 7-day group (0.9 v. 1.6 at 5 days and 1.2 v. 2.1 at 9 days, both p < 0.001). The results of this randomized controlled double-blind clinical trial suggest that a 3-day course of an antibiotic with proven efficacy is not inferior to a 7-day course for the treatment of uncomplicated symptomatic UTI in older women and that adverse events are less frequent with the shorter course of therapy. Few studies have been conducted on optimal duration of treatment for uncomplicated symptomatic UTI in older women. 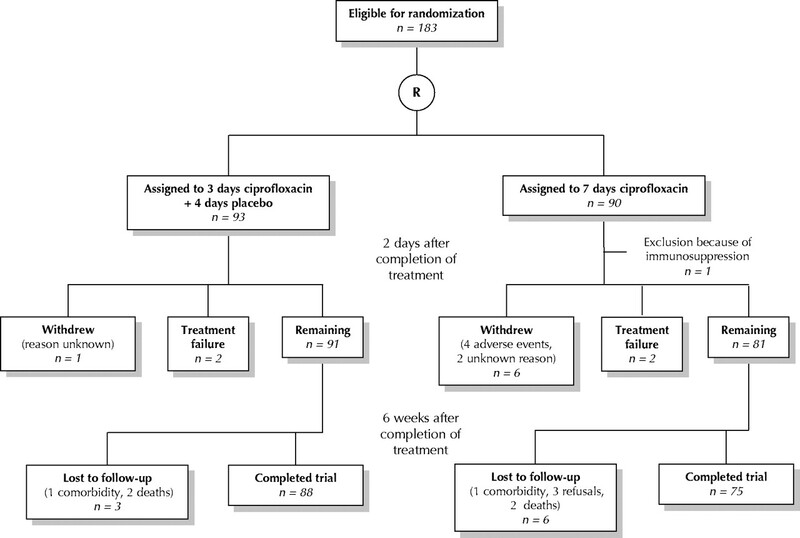 Raz and Rozenfeld12 conducted an open trial comparing a 3-day treatment with ofloxacin with a 7-day course of cefalexin in 223 postmenopausal women with symptomatic uncomplicated UTI. Rates of eradication were 77.3% and 63.5% respectively at 3 to 5 days after completion of treatment, and clinical improvement was similar in the 2 groups. However, the groups were not exposed to the same antibiotic, and the study was performed without blinding. Dontas and associates13 found no statistically significant difference in bacterial eradication with 3, 10 or 20 days of treatment with cotrimoxazole, but their study was limited to residents of long-term care centres with chronic asymptomatic bacteriuria, and small sample sizes were used. In a subgroup of 160 women over 40 years of age with uncomplicated symptomatic UTI, from a randomized double-blind trial by Iravani and colleagues,14 the eradication rate was higher with 7 days of antibiotic therapy than with 3 or 5 days of treatment. However, the choice of antibiotic differed between groups, and few of the participants were over 65 years of age. A few trials comparing single-dose therapy with a longer course of treatment (usually 7 to 10 days) for bacteriuria in older people have yielded conflicting results.15,16,17 Finally, published series describing 3-day18,19 and 5-day11,20 courses of antimicrobial therapy for acute or chronic bacteriuria in older women have reported rates of bacterial eradication ranging from 31% to 93%, but none of these studies included a comparison group with longer treatment duration. The present study is, to our knowledge, the first randomized controlled trial with complete double-blinding procedures comparing 2 durations of treatment with the same antibiotic for the management of uncomplicated symptomatic UTI in older women. Moreover, few of the subjects were lost to follow-up, and the statistical power was reasonably good. Urine cultures could not be obtained at 2 days after completion of treatment for 7 subjects (3.8%), who withdrew mainly for reasons related to adverse events. At the 6-week evaluation, urine cultures were unavailable for 9 additional subjects (4 who died, 3 who refused further participation and 2 with comorbidities). Although these losses to follow-up might have affected the results, the intention-to-treat analysis was performed such that patients lost for unknown reasons or comorbidity were considered to represent treatment failure in the 3-day group and treatment success in the 7-day group, to minimize the potential for bias. In conclusion, our findings suggest that a 3-day course of antibiotic therapy for uncomplicated symptomatic UTI in older women offers similar efficacy to the more standard 7-day therapy, with significantly fewer adverse events. Shorter antibiotic treatment may also contribute to better compliance and fewer drug interactions and may thus be of particular interest for the older population. Large-scale clinical trials are needed to confirm these results, especially among frail older patients, who are at increased risk of treatment failure but who would also benefit most from a shorter course of therapy in terms of compliance and drug interactions. Contributors: René Verreault was responsible for project conception, protocol development and data collection; he also contributed to the statistical analyses and to the writing and revision of the manuscript. Thomas Vogel was responsible for the statistical analyses, writing and revisions. Marie Gourdeau, Michèle Morin and Lise Grenier-Gosselin contributed to protocol development, writing and revisions. Louis Rochette contributed to the statistical analyses, writing and revisions. Acknowledgements: This work was supported by a grant from the Fonds de la recherche en santé du Québec (grant 961464-104). René Verreault was supported by a grant from the Chaire de gériatrie de l'Université Laval. Nicolle LE. Urinary tract infection in the elderly. J Antimicrob Chemother 1994;33(Suppl A):99-109. Mulholand SG. Urinary tract infection. Clin Geriatr Med 1990;6(1):43-53. Gray RP, Malone-Lee J. Urinary tract infection in elderly people — time to review management? [review]. Age Ageing 1995;24(4):341-5. Beyer I, Mergam A, Benoit F, Theunissen C, Pepersack T. Management of urinary tract infections in the elderly. Z Gerontol Geriat 2001;34(2):153-7. Lutters M, Vogt N. Antibiotic duration for treating uncomplicated, symptomatic lower urinary tract infections in elderly women [Cochrane review]. In: The Cochrane Library; issue 3, 2002. Oxford: Update Software. Stamm WE, Hooton TM. Management of urinary tract infections in adults. N Engl J Med 1993;329(18):1328-34. McIsaac WJ, Low DE, Biringer A, Pimlott N, Evans M, Glazier R. The impact of empirical management of acute cystitis on unnecessary antibiotic use. Arch Intern Med 2002;162:600-5. Cockcroft DW, Gault MH. Prediction of creatinine clearance from serum creatinine. Nephron 1976;16(1):31-41. Desrosiers J, Bravo G, Hébert R, Dubuc N. Reliability of the revised functional autonomy measurement system (SMAF) for epidemiological research. Age Ageing 1995;24(5):402-6. Newcombe RG. Interval estimation for the difference between independent proportions: comparison of eleven methods. Stat Med 1998;17(8):873-90. Newsom SW, Murphy P, Mattews J. A comparative study of ciprofloxacin and trimethoprim in the treatment of urinary tract infections in geriatric patients. J Antimicrob Chemother 1986;18(Suppl D):111-5. Raz R, Rozenfeld S. 3-day course of ofloxacin versus cefalexin in the treatment of urinary tract infections in postmenopausal women. Antimicrob Agents Chemother 1996;40(9):2200-1. Dontas AS, Giamarellou H, Staszewska-Pistoni M, Petrikkos G, Iakovou M, Tzias V. Short vs. long cotrimoxazole courses in eradicating bacteriuria in the elderly. J Chemother 1992;4(2):114-8. Iravani A, Tice AD, McCarty J, Sikes DH, Nolen T, Gallis HA, et al, for the Urinary Tract Infection Study Group. Short-course ciprofloxacin treatment of acute uncomplicated urinary tract infection in women. The minimum effective dose [published erratum appears in Arch Intern Med 1995;155(8):871]. Arch Intern Med 1995;155(5):485-94. Lacey RW, Simpson MH, Lord VL, Fawcett C, Button ES, Luxton DE, et al. Comparison of single-dose trimethoprim with a five-day course for the treatment of urinary tract infections in the elderly. Age Ageing 1981;10(3):179-85. Ferraro G, Ambrosi G, Bucci L, Palmieri R, Palmieri G. Fosfomycin trometamol versus norfloxacin in the treatment of uncomplicated lower urinary tract infections of the elderly. Chemotherapy 1990;36(Suppl 1):46-9. Flanagan PG, Rooney PJ, Davies EA, Stout RW. A comparison of single-dose versus conventional-dose antibiotic treatment of bacteriuria in elderly women. Age Ageing 1991;20(3):206-11. Ewer TC, Bailey RR, Gilchrist NL, Aitken JM, Sainsbury R. Comparative study of norfloxacin and trimethoprim for the treatment of elderly patients with urinary tract infection. N Z Med J 1988;101(852):537-9. Tzias V, Dontas AS, Petrikkos G, Papapetropoulou M, Dracopoulos J, Giamarellou H. Three-day antibiotic therapy in bacteriuria of old age. Antimicrob Agents Chemother 1990;26:705-11. Gallacher G, Erwin L, Scott PJ, Sleigh JD. Augmentin (amoxycillin-clavulanic acid) compared with amoxycillin in the treatment of urinary tract infections in the elderly. J Infect 1986;12(3):229-33. Gupta K, Hooton TM, Stamm WE. Increasing antimicrobial resistance and the management of uncomplicated community-acquired urinary tract infections. Ann Intern Med 2001;135(1):41-50. Zhanel GG, Karlowsky JA, Harding GK, Carrie A, Mazzulli T, Low DE, et al. A Canadian national surveillance study of urinary tract isolates from outpatients: comparison of activities of trimethoprim–sulfamethoxazole, ampicilline, mecillinam, nitrofurantoin, and ciprofloxacin. Antimicrob Agents Chemother 2000;44(4):1089-92. Are 3 Days of Antibiotics Enough for Older Women with UTIs? Can hockey playoffs harm your hearing?